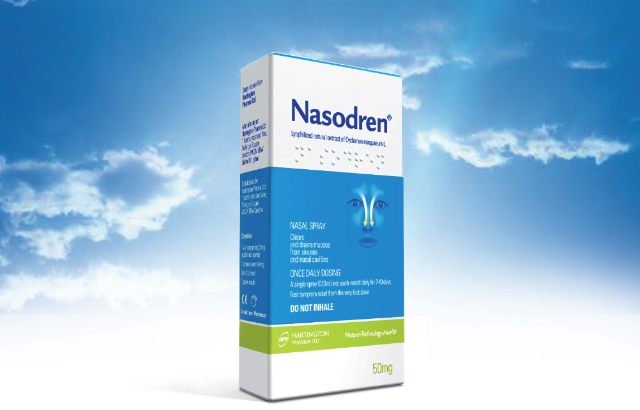 Nasodren for Sinusitis Treatment: Use of a new plant extract-based product in the early postoperative care of patients with productive rhinosinusitis. Use of a new plant extract-based product in the early postoperative care of patients with productive rhinosinusitis. “Use of a new plant extract-based product in the early postoperative care of patients with productive rhinosinusitis”. The purpose of this study was to determine the usefulness of a new plant extract-based product in patients operated for productive rhinosinusitis and maxillary sinus cysts after administration in the early postoperative period. Our results show that its use as monotherapy after surgery is associated with a rapid clearing of the nasal meatus and sinuses, restoring normal rhinoscopic findings between the fifth and sixth day after administration of the preparation. significant percentage of patients who suffer further obstruction after surgery. Among other reasons, this is due to the inflammatory congestive process, tissue oedema and hyperaemia caused by the surgicalaggression. Although various treatments have been used in the postoperative period to palliate this problem, the results are not yet as satisfactory as they should be (Gerber et al. 2003; Aukema & Fokkens 2004; Cohen 2006). The plant extracts studied have the advantage that they naturally favour drainage of the secretions from the nasal passages and paranasal sinuses, helping to clear the mucus content accumulated after surgery. The results of our study clearly show that their use helps in this process in the immediate postoperative period in patients operated for productive rhinosinusitis and maxillary sinus cysts. Furthermore, it is not only effective but the effect is quicker than other alternatives. Thus, the use of natural plant extracts rapidly drains the sinuses and nasal meatus. The rhinoscopic findings become normal between the fifth and sixth day of treatment, which is three or four days sooner than with the traditional methods of postoperative care, such as nasal irrigation. The images included with this study clearly illustrate this new product’s usefulness. In addition, its efficacy in other nasal or paranasal conditions has been shown in other studies (Zasritskaia et al. 2006; Khechinashvili et al. 2006; Chernisheva & Siniachenko 2006). A particular feature of its use in the early postoperative period is the relatively low sensitivity of the mucous membrane to the product. As a result, patients only feel a slight smarting after administration. When the product’s action has ended, almost all patients report a slight dryness in the nose. This good tolerability is due, among other reasons, to the fact that it is a completely natural product. In conclusion, the results obtained in this study show that use of this new plant extract- based product provides an effective treatment in the early postoperative care of patients after endoscopic surgery for productive rhinosinusitis. What kind of food produce mucus?